Keith Weber has been an achiever all his life, and he was debating pursuing either computer programming or law as a career during high school. He attended Central New Mexico Community College concurrently with his high school course work and graduated with an Associate of Arts and Sciences degree in Paralegal Studies three months after he graduated from high school. After working as a paralegal for a summer, he decided he enjoyed computer programming more than law. Keith was a National Merit Scholar, and was given an Academic Scholarship at the University of Alabama. He graduated with his Bachelor of Sciences in Computer Science after 3 years of study, and he graduated with his Master of Sciences in Computer Science the next year. During his college career he received numerous awards including Outstanding Sophomore in Computer Science, the H. H. Chapman Award, the Jane Nix Service Award, and membership in Golden Key Honor Society, National Society of Collegiate Scholars, Alpha Lambda Delta, Phi Eta Sigma, Phi Theta Kappa and Upsilon Pi Epsilon. Keith also knows the hardware end of things. In his school career he managed his high school network of over 500 hundred computers, the University of Alabama Computer Science department network, and the University of Alabama Honors College network. During his middle and high school careers, he worked as a computer technician and had clients all over the city of Albuquerque. Keith has worked for Duke City Software since 2006. Most of his duties are programming in PHP and MySQL to create custom website applications; however, his flexibility and adaptability have allowed him to handle any situation that has arisen. This has included anything from maintaining databases in Microsoft Access to writing BASH scripts to read barcodes from PDF files. The New Mexico Health Insurance Alliance (NMHIA) website was designed by Griffin and Associates to be an effective call-to-action for individuals and families needing insurance and for agents wanting additional products to market. Duke City Software implemented a series of eligibility questions, an agent directory, a customized online health insurance quoting application, and a back-end system for health insurance agents including the ability to dynamically update their information and create a customized brochure for prospective clients with agent information on it. Agents are able to print out rates filtered by county and also by insurance company. They are also able to create and print client specific rate quotes determined by a client's needs. Finally, semi-annual rate adjustments that used to take weeks to implement are now implemented in a matter of hours. Albuquerque The Magazine is staffed with excellent designers. They designed the website and we implemented it for them. They chose to update the site themselves using Contribute rather than a content management system. We administer their shopping cart and have developed custom software applications for Hot Singles nominations, Top Docs voting, Top Dentists voting and the renowned Best of the City voting. We've also installed a blog for the Favorite Places updates and incorporated a Facebook plug-in. The site uses Google Ad Manager to serve advertisements on the site. In 2012 New Mexico celebrated 100 years of statehood. The celebrating New Mexico Statehood site was designed by a local firm with content provided by the client. Duke City Software implemented the design using the Drupal Content Management System to give the content the desired look and feel. The Summer Food New Mexico site was designed by Sandman Design. We developed custom software that stores and displays free food sites for hungry New Mexico children. The sites are integrated with Google maps and are updated several times each summer. The custom software developed utilizes Google Maps© to allow users to find the free food site closest to them. It also includes a one-time survey designed to give demographics of how users heard about the site and other information. There are also versions of the website both in English and Spanish using the same programming. 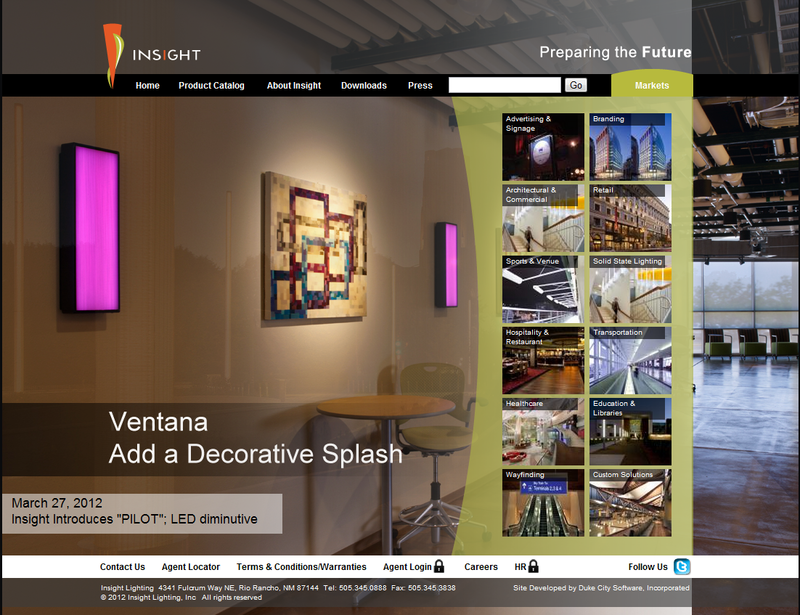 The Insight Lighting website is designed to showcase Insight Lighting's beautiful products. This is not a store since all products are purchased through distributors. The intent of the website is to showcase the products and allow distributors to easily locate product specifications. The site was designed by a local Albuquerque firm. We implemented the design. Several of the pages - About, Press, Contact Us and Careers - are implemented in WordPress so that Insight Lighting staff can update those pages as needed. Most of the other pages are dynamically generated from data stored in a database using custom software that Duke City Software created. Staff use an admin interface to update product data and the data is displayed in different ways depending on the page being accessed. The site also includes slideshows on multiple pages and a scrolling marquee on the home page. 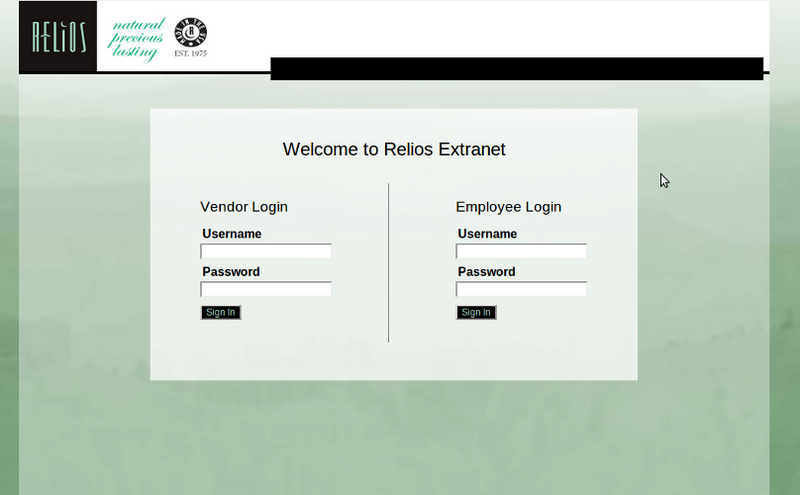 Duke City Software created an intranet application for the Relios Corporation to help streamline a number of internal processes. This includes making a material intake form into a paperless operation. This has reduced the amount of paper and time needed to complete the intake process. There is also the capability to track particular shipments of materials through the whole process and communicate with vendors regarding any changes needed and the status of their shipments. In the case of needing hard copies of the online forms, the system is able to convert the online form to a PDF that can be emailed or printed out depending on the need. In addition to this, there is also an application which incorporates the color quality system for the various gems used in the jewelry. This system has removed the need for quality control employees to each have a several hundred page color control manual for all of the different gems. Rather, the manual is hosted completely online so employees are constantly up to date and can make any changes needed to the system completely in real time. Finally, Duke City Software has created custom programs that Relios uses to interface with their different sales systems and combine them into a unified system and creates reports and other outputs from these diverse inputs. 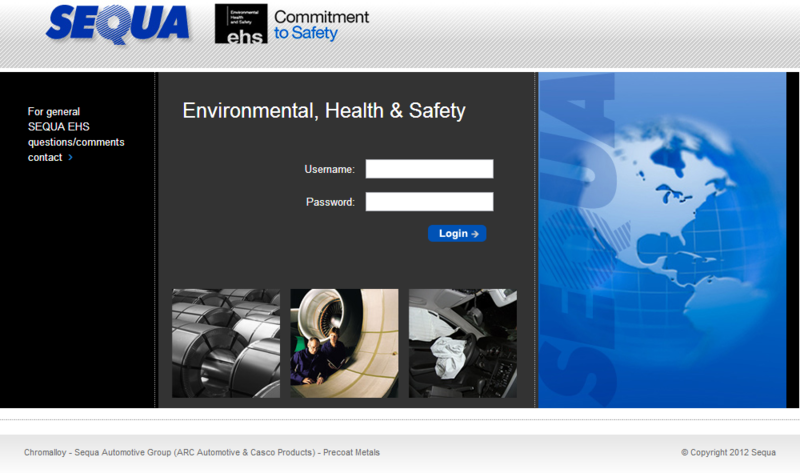 We created a website for the Sequa Corporation's Environmental, Health and Safety Division. They needed a solution that allowed them to collect data from all around the world as well as display and manipulate that data to provide executives and location managers with data summaries and reports for effective decision-making and issue tracking. We provided them with a number of solutions for their various needs, including a dashboard system, active alerts, document library, blog, pdf reports, Excel reports and a monthly summary email sent to the division directors that incorporates a mix of notifications, statistics and changes during the previous month. You guys are great, always available and understanding. It is such a relief knowing I have someone I can call and I don't have to learn how to do all this you guys just take care of it for me.